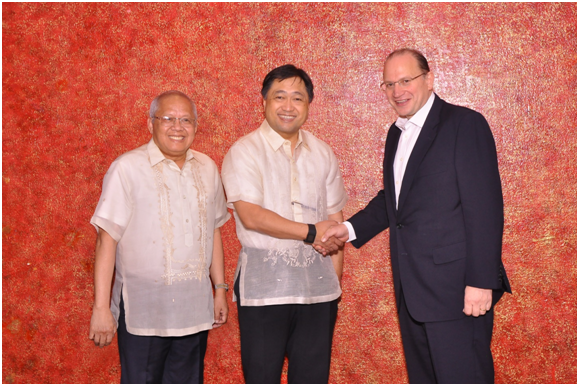 Recognizing the Philippines as an important market of AIA, the Chief Executive Officer and President of AIA Group, Mark Tucker (right) was recently in Manila to meet with the Philam Life agency force as they move “Faster, Stronger, and Higher” this 2016. During his trip, he also met with Department of Finance Secretary Cesar V. Purisima (center) and Insurance Commissioner Emmanuel F. Dooc (left) at the Philam Life Tower in Makati City. Philam Life is a subsidiary of the AIA Group, the world’s second largest life insurer and the largest independent publicly-listed pan-Asian life insurance group with presence in 18 markets in Asia-Pacific. AIA was established in Shanghai 90 years ago. It is a market leader in the Asia-Pacific region (ex-Japan) based on life insurance premiums and holds leading positions across the majority of its markets. It had total assets of US$172 billion as of 31 May 2015.